Glucometers play an important role in helping patients with diabetes manage the disease, as these devices track blood glucose fluctuations. There are a variety of glucometers available, with basic to advanced features.1 Pharmacists can educate patients about glucometers, providing instructions on appropriate use, for instance. A recent study assessed the accuracy of 18 glucometers marketed in the United States, with the assessment comprising about 90% of all available devices from 2013 to 2015 that were cleared by the FDA.4 The study included 1035 participants tested at 3 study sites, and the passing standard was considered within 15% or 15 mg/dL of the laboratory value. Participants were 18 years and older with no instances of diabetes, prediabetes, type 1 diabetes, or type 2 diabetes. The study found that just 6 of the 18 glucometers passed: Accu-Chek Aviva Plus, Accu-Chek SmartView, Contour Next, CVS Health Advanced, FreeStyle Lite, and Walmart ReliOn Confirm (Micro).4 Furthermore, this study can play a key role in counseling patients on the selection of a glucometer. In an interview with Pharmacy Times®, Andrea Levin, PharmD, BCACP, assistant professor in the Department of Pharmacy Practice at Nova Southeastern University College of Pharmacy in Davie, Florida, discussed important counseling points for glucometers. She emphasized the importance of checking strips to ensure that they have not expired and that patients should program the correct times into the glucometer. Also, individuals taking medications, such as insulin, that can cause hypoglycemia should have their glucometers with them at all times. Levin added that patients should not leave glucometers in a car because extreme heat can affect their efficacy. She also recommended using control solution periodically to ensure that a glucometer is working properly. Patients should be counseled about the signs and symptoms of hypoglycemia, which include confusion, nervousness, shakiness, sleepiness, and sweating. Patients experiencing these symptoms should check their blood glucose levels immediately. Hypoglycemia is considered blood glucose <70 mg/dL and should be treated with 15 g of carbohydrates (eg, glucose tablets, juice).3 Individuals should check their blood glucose again after 15 minutes of treatment, and if it is still <70 mg/dL, they should have another 15-g serving of carbohydrates. Jennifer Gershman, PharmD, CPh, is a drug information pharmacist and Pharmacy Times contributor who resides in south Florida. Blood glucose meter: how to choose. Mayo Clinic website. mayoclinic.org/ diseases-conditions/diabetes/in-depth/blood-glucose-meter/art-20046335. Published December 17, 2016. Accessed January 20, 2019. American Diabetes Association. 7. Diabetes technology: Standards of Medical Care in Diabetes-2019. Diabetes Care. 2019;42(suppl 1):S71-S80. doi: 10.2337/dc19-S007. American Diabetes Association. 6. 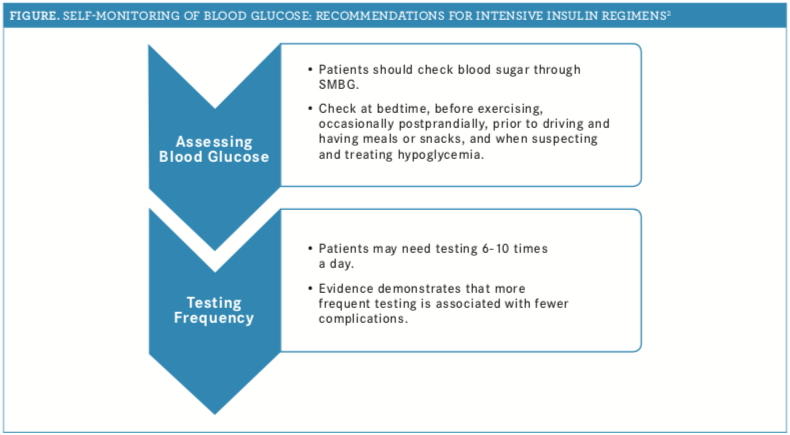 Glycemic targets: Standards of Medical Care in Diabetes-2019. Diabetes Care. 2019;42(suppl 1):S61-S70. doi: 10.2337/dc19-S006. Klonoff DC, Parkes JL, Kovatchev BP, et al. Investigation of the accuracy of 18 marketed blood glucose monitors. Diabetes Care. 2018;41(8):1681-1688. doi: 10.2337/dc17-1960. American Diabetes Association. Blood glucose meters. Diabetes Forecast website. main.diabetes.org/dforg/pdfs/2018/2018-cg-blood-glucose-meters.pdf. Accessed January 20, 2019.